At its 2016 Annual Meeting Wednesday, June 15, 2016, Textile Center announced the appointment of five internationally renowned fiber artists to serve on its new National Artist Advisory Council: Carolyn Halliday, Dr. Carolyn Mazloomi, Mary Giles, Pat Hickman, and Tracy Krumm. These extraordinary artists and leaders will serve as advocates and advisors to Textile Center, advancing its exhibitions, education programs, fellowships and services to support working fiber artists. “We are fortunate to have this stellar cohort of artists joining us to support Textile Center’s mission to honor textile traditions, promote excellence and innovation, and inspire widespread participation in fiber art,” says Textile Center Executive Director Karl Reichert. “Textile Center is unique in the nation, particularly for the way it brought together more than 30 textile guilds in the region to form a unique national center for fiber arts 22 years ago. Thanks to Textile Center, fiber art is abundant and flourishing in Minnesota, and we attract artists from around the world to participate in our exhibitions and educational programming. Mary Giles of Stillwater, MN, is a self-proclaimed “fiberist” who uses the traditional basketry technique of coiling alongside contemporary materials of waxed linen, copper, and iron. Last summer Textile Center presented Mary Giles: A Retrospective in the Joan Mondale Gallery. 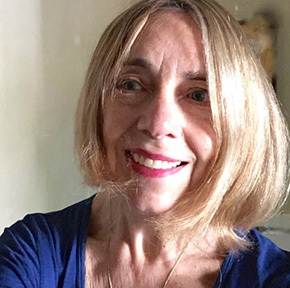 Pat Hickman of Haverstraw, NY, is Professor Emeritus of the Art Department, University of Hawaii, where she taught for sixteen years. Her studio is now at the Garnerville Arts and Industrial Center in Garnerville, NY. She most recently served as Textile Center’s juror for the 2016 Jerome Fiber Artist Project Grant program. Dr. Carolyn Mazloomi of West Chester, OH, is the founder of the Women of Color Quilters Network (WCQN), and is the 2016 inductee to the Quilters Hall of Fame Museum. In 2014, she was named a National Heritage Fellow by the National Endowment for the Arts, the highest award given in the United States for traditional arts. Carolyn Halliday, Chair, has been showing her work throughout the nation for nearly two decades, earning a variety of awards. In spring of 2014, she was the featured visual artist for an episode of the televised TPT (Twin Cities PBS) production Minnesota Originals. She was a 2013 recipient of a Minnesota State Arts Board Artist Initiative Grant. Halliday is a featured artist in the book Knitting Art: 150 Innovative Works from 18 Contemporary Artists and in the book How to Be a Feminist Artist: Investigations from the Women’s Art Institute. Her work has also appeared in Surface Design Journal and Interweave Knits. Actively committed to participating in the Twin Cities arts community, she has been a guest juror at various institutions including the Weisman Art Gallery, past president and former education chair for the Weavers Guild of Minnesota, and a member of a local spinning group, created 25 years ago. For more than a decade, she continues to promote artists’ peer critique by teaching and facilitating the Critical Response mode. Previously the Lead Mentor for the Textile Center Mentor/Protégé Program, she is currently a Mentor in the WARM (Women’s Art Resources of Minnesota) Mentor/Protégé Program and mentors artists privately. She has been employed by the Minneapolis College of Art and Design and was a teaching assistant for the Women’s Art Institute, offered through MCAD and St. Catherine University. Her work is included in the Minnesota Historical Society’s fiber art collection. Historian, Curator, Author, Lecturer, Artist, Mentor, Founder, and Facilitator — the remarkable Dr. Carolyn Mazloomi has left her mark on many lives. 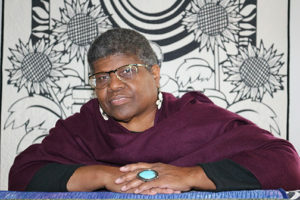 Trained as an aerospace engineer, she turned her sights and tireless efforts in the 1980s to bring the many unrecognized contributions of African American quilt artists to the attention of the American people as well as the international art communities. From the founding of the African-American Quilt Guild of Los Angles in 1981 to the 1985 founding of the Women of Color Quilters Network (WCQN), Mazloomi has been at the forefront of educating the public about the diversity of interpretation, styles and techniques among African American quilters as well as educating a younger generation of African Americans about their own history through the quilts the WCQN members create. Mazloomi’s quilts can be found in private collections around the world as well as in distinguished museum collections in the United States. To date she has published nine books highlighting African American-made quilts. Her artistic work, as well as her defense of solid research, has disrupted long-standing myths about African American quilts, myths much debated among quilt historians and quilters alike, and thus moved the conversation about African American quilt history forward to more a solid academic footing. Her national honors include the 2003 Ohio Heritage Fellowship Award, the first such award for any Ohio citizen. 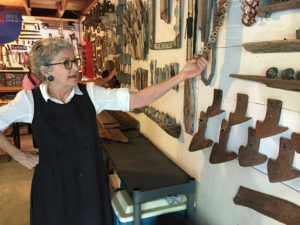 In 2014 the National Endowment for the Arts named her a National Heritage Fellow, the highest award given in the United States for traditional arts. In 2014 she was awarded the Distinguished Scholar & Celebrated Artist Lifetime Achievement Award by Faith Ringgold’s Anyone Can Fly Foundation. Mazloomi is the 2016 inductee to the Quilters Hall of Fame Museum. A native Minnesotan, Mary Giles was born in St. Paul and currently resides on the St. Croix River, north of Stillwater. It was when Giles was preparing to teach weaving to a high school class in the late 1970s that she discovered basketry forms and proceeded to develop techniques through workshops with fiber artists Walter Nottingham, Ferne Jacobs, Lissa Hunter, Diane Itter, Jane Sauer and John McQueen. Inspired by indigenous art, Giles also sought out and learned from Native American basket makers. Giles’ work has been displayed in numerous galleries and museums in the United States, at the Barbican Centre in London, and has represented the U.S. at the International Triennial of Tapestry in Lodz, Poland. In 2013 she was named The Master of Fiber Arts by the Renwick Alliance of the Smithsonian Museum. Her work is included in the collections of over a dozen museums, including: Minneapolis Institute of the Arts, Minneapolis, MN; Arkansas Arts Center, Little Rock, AR; Racine Art Museum, Racine, WI; Contemporary Art Museum, Honolulu, HI; Erie Art Museum, Erie, PA; Detroit Institute of Arts, Detroit, MI; Fine Arts Museum, San Francisco, CA; Museum of Arts & Design, New York, NY; and St. Louis Art Museum, MO. Pat Hickman is Professor Emeritus of the Art Department, University of Hawaii, where she taught for sixteen years. Her studio is now at the Garnerville Arts and Industrial Center, NY and she lives nearby on the Lower Hudson River. Hickman’s work is in major collections, including the Renwick Gallery, Smithsonian Institution, the Oakland Museum, the Philadelphia Museum of Art, the Boston Museum of Fine Arts, the Denver Art Museum, the Honolulu Academy of Arts, and the Hawaii State Art Museum, among others. In Hawaii, Hickman’s commission, Nets of Makali’i–Nets of the Pleiades, stands as monumental entrance gates for the Maui Arts and Cultural Center. Hickman twice received NEA Individual Artist’s Grants. In 2005, she was elected a Fellow of the American Craft Council, and she served as President of the Textile Society of America (2008-2010). Hickman curated two traveling exhibits: Innerskins/Outerskins: Gut and Fishskin (1987) and Baskets: Redefining Volume and Meaning (1993). 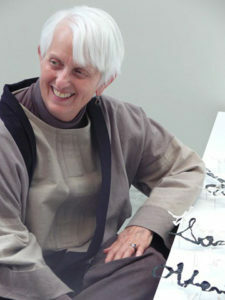 A sculptor, educator and researcher of material studies and textile processes in metal and mixed media, Tracy Krumm has exhibited her work internationally in more than 175 gallery and museum exhibitions during the past 25 years, including: the Cheongju Biennial in South Korea; the Triennial of Textiles at the Central Museum in Lodz, Poland; the 4th Betonac Prize in Sint Truiden, Belgium; the Fine Arts Museum of New Mexico in Santa Fe; the American Craft Museum in New York; the Kohler Art Center in Sheboygan, WI; and the National Museum of Women in the Arts in Washington, DC. She was recently awarded a 2015-2016 McKnight Visual Artist Fellowship in support of her studio practice. She received her BFA with High Distinction from the California College of Arts and Crafts in 1987 and her MFA in visual art from Vermont College in 1995. 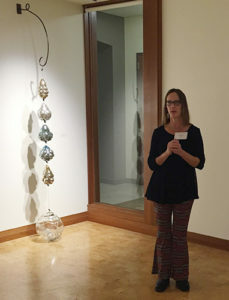 She has been a visiting artist and lecturer at numerous institutions since 1990 including Virginia Commonwealth University’s Craft and Material Studies Program, the Witt Visiting Artist Program at the University of Michigan, Cranbrook, the Memphis College of Art, UC Santa Cruz, the University of Montana, Anderson Ranch, Arrowmont, Haystack, and Penland. She was a Visiting Assistant Professor and Associate Member of the Graduate Faculty in Art + Design from 2006-2008 at North Carolina State University in Raleigh and an Assistant Professor in the Fiber Department and Community Arts and Service Learning Program at the Kansas City Art Institute from 2008-2012. Krumm is currently an Associate Lecturer in the Art Department at the University of Wisconsin, River Falls, and maintains a studio practice in St. Paul, MN.